For the month of Movember, I’ve been supporting my Mo’ Bros by offering a few helpful insights into the female mind. This is the last of the Movember Questions of Doom series. QOD #4: Do you like this casserole? “Yes” – I hope you really do like it, ‘cause you’re gonna get it every second week from now until doomsday. “No” – You know the drill. Icy silence and/or tears and/or wild accusations of “You don’t appreciate anything I do”. And you aren’t going to be getting any for a good long time. You know I’m not talking about casserole. Good luck, bro. You’re gonna need it. Bonus QOD: Did you make that doctor’s appointment yet? Movember Moment: Guys, if you haven’t done it already, go and get your prostate checked. A few moments of discomfort are well worth the relief of knowing you’re fine; or, worst-case scenario, the sooner they find a problem, the more easily it can be dealt with. And if you’re feeling despairing or anxious; if you’re self-destructive or you can’t control your temper, please talk to your doctor. There’s no shame in asking for help. If you had computer problems, you wouldn’t just put up with it and hope it’d get better, and you wouldn’t feel inadequate if you couldn’t fix it yourself (and you know how badly it can turn out if you try). Please treat yourself at least as well as you treat your computer. We Mo’ Sistas want to keep you around, happy and healthy, for a long time. So go make that appointment. P.S. Thanks to Le Clown for starting Bloggers for Movember. In support of the cause, I’m donating half the November royalties from my paperback and e-book sales from all channels to the Cancer Society. Only two days left – please spread the word! You had me in stitches, thank you. Especially the dead Aunt. Then you want e to get a doctor to shove his hand where the Sun don’t shine. Sobbered me up a bit. Ok, I’ll eat my casserole. holy freakin crap Diane!! I guess you are a true redhead, based on the color of your stache 🙂 that is just hysterical. Only thing missing are some crumbs, mustard and ketchup sauce.lol. Seriously though, I thought you were one of the rocket science PhDs working in my building, minus the stains, hairy legs, & flip-flops.lol. The stains are all hidden under the ‘stache. And I make no comment, express or implied, regarding the presence/absence of hairy legs and flip-flops. Wife cooks it, I eat it. Pretty simple rules. And if the “beans are too salty” well, “that is just the way I like them”. I have even learned to appreciate fish…sort of. A handy read that will help you tackle innocuous looking but potentially incendiary queries of everyday life..A life changer in more ways than one for sure! 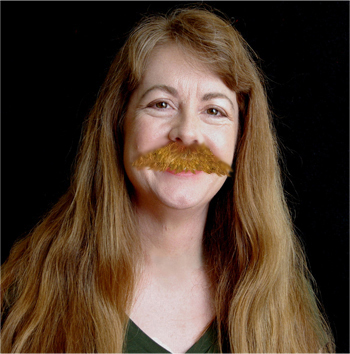 Luv the ‘stache Diane and thanks for the giggles & guffaws on QOD and for supporting a rather touchy subject (no pun intended). We have been there…prostate cancer runs in my husband’s family. So here is another commercial – a routine check up is a piece of cake compared to going through treatment for three years – cancer free now, hooray! I’ll eat whatever you put in front of me, as long as you don’t blast me with your six shooter, Yosemite. If I had a ‘tache like that, Diane, I would be itching until the end of the world! 😉 And I love casserole, so I wouldn’t complain there! By the way… thanks for adding my little badge – I really appreciate it! Yes, I have to say I’m glad that rug isn’t attached to my face. And I think your badge is very cool – looking forward to the party! Great Movember wrap-up post. And that is one sweet stache! Thank you, for being with us from day one, and to the end. My mustache is so long now, that everything I eat has a taste of hair. Delicious. Thanks, Le Clown! Mmmmm, hair pie. Not going with the obvious off-colour joke… instead, I’ll say “I’m glad you’re getting adequate fibre in your diet”. Love the moustache. And I’d probably love the casserole too. Am pretty easy to please when it comes to food!